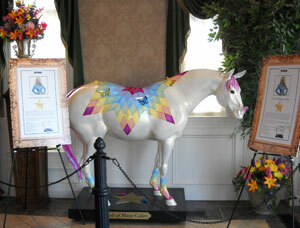 The Trail of Painted Ponies is proud to announce that legendary country and western singer Dolly Parton has designed a spectacular Painted Pony inspired by her hit song, Coat of Many Colors. The song tells a heartwarming story of a penniless young girl whose mother sews her a patchwork coat out of rags, which she wears to school proudly, and when other children laugh, she gives them a quick lesson about what it truly means to be "rich." Cleverly titled Colt of Many Colors, Dolly Parton's design uses a beautiful star-pattern quilt and butterflies to magically give her song "Coat of Many Colors," new life through her Painted Pony. Dolly Parton would like everyone who views her Painted Pony to consider these words: "Though we had no money growing up, I was as rich as I could be, in my coat of many colors that my Mama made for me. Remember, one is only poor if you choose to be." Colt of Many Colors is currently on display at Dolly Parton's Stampede in Branson, Missouri, where it is available for sale. Colt of Many Colors has been valued at $75,000. Shipping within the United States will be at no charge. A tax-deductible percentage of the proceeds will go to Dolly's favorite charities, Dollywood Foundation and Dolly Parton's Imagination Library. To learn more about Dolly Parton's Imagination Library, Click Here. The Trail of Painted Ponies is a fine arts and collectible company that explores the inspirational power of the horse by inviting artists to imaginatively transform elegant horse sculptures into dazzling works of original art. The most spectacular Painted Ponies are then crafted into beautiful, high-quality figurines that are miniature artworks in their own right. Painted Ponies figurines have become one of the most beloved collectibles in America.